Scott and I went to the MCHS freshman basketball tournament this evening. 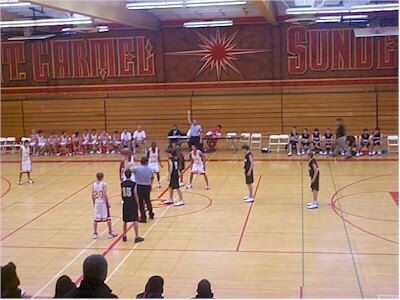 In this last game, the Sundevils played host to their new rivals from Westview HS, which just opened up in our neighborhood this year. Fortunately, Mt. Carmel was able to defeat the Wolverines. We knew players on both teams. The Sundevils coach also coaches Scott's 8th grade club team, grooming the youngsters for their time on the MCHS team next year.